Statistics Canada is making significant changes to the way that the Canadian census is conducted. Beginning in 2011 the long census form will no longer be distributed to Canadians. Previously, this portion of the census collected information on topics such as ethnicity, religion, employment, education, income, and various other social concerns. Information on some of these topics will now be gathered by a new voluntary National Household Survey (NHS). Unlike census information, data gathered through the NHS is not subject to the same laws regarding release of information to the public. Statistic Canada does not currently release information gathered through surveys, meaning that a valuable resource for researchers is essentially being eliminated. Historians, genealogists, sociologists, and numerous other researchers all use census data generated through the old long census form. Genealogy is on the rise in Canada and one of the primary resources genealogists rely on is census data. 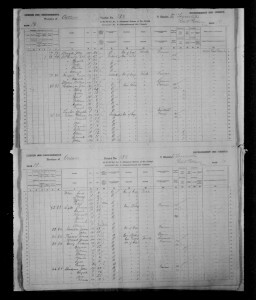 The public release of Canadian census data collected prior to 1911 has made it easier for anyone to explore their family’s past. Additionally, census data is used to track changes over time, to learn more about factions of society, track migration patterns, and examine various other social history topics. It is not clear if the new NHS will include all of the topics previously covered by the long census form or if it will be changing the type of information collected. In previous years, the long census was distributed to 1 out of 5 families. The new survey will be sent to 1 of 3 families. However, the survey will be completely voluntary. The voluntary aspect of the NHS has the potential to impact the validity of the results, as certain segments of the population are traditionally less inclined to respond to surveys. This has the potential to drastically skew the results. A lot of government policy relating to community groups and local programming has traditionally been crafted out of the data collected via the long census form. The use of the voluntary NHS has the potential to impact the creation of policy and impact the funding which community programming receives. The voluntary survey has the potential to handicap the practicality of using census data to shape policy. According to Statistics Canada, the decision to eliminate the long census form was based on privacy concerns held by the Canadian public. The increased desire for protection of personal information is nothing new. However, the data previously collected by the long census form was only released to the public 92 years after it was collected. This delay in releasing detailed information was enacted as a means of protecting privacy and still allowing the public to benefit from the information collection. Despite the claims that these changes were enacted in the name of privacy, according to the Office of the Privacy Commissioner the actual number of complaints about the census has dropped in recent years. Additionally, there have been suggestions that the feedback report Statistics Canada received following the last census made no mention of privacy at all. Even prior to the exposure of the lack of evidence of privacy complains, the Liberal Party began to urge the Conservatives to recant their decision. The Liberals have called the census changes a veiled attack against social services and see it as a serious blow to future policy creation. Overall, the movement to a voluntary survey, with results that may never be made public, is a serious blow to social research, compromises the ability to track long term trends, and has the potential to drastically impact future government policy. A petition to keep the Canadian census long form can be found here. Thanks for this post, Krista. The recent Canadian debate has been fairly quiet on the fact that the United Kingdom has announced plans to scrap its census completely after 2011, citing difficulties in accurately counting people in an increasingly mobile age. 1.5 million of its 24 million people didn’t fill out the 2001 British census, with only 38 convictions for noncompliance. The British have held a decennial census since 1801, and have traditions of censuses going back centuries. Not surprisingly, the importance of census information for the writing of history has also been part of the British debate. As one commentator recently remarked on the end of census: “Future historians will be less able to interpret Britain in the Cameron/Clegg era as a result of this decision – maybe that is the reason for it”. What a great post, and such an important issue for so many people. You know you’ve struck a nerve when you can get labour leaders and business leaders on the same page. Too many compelinmts too little space, thanks!